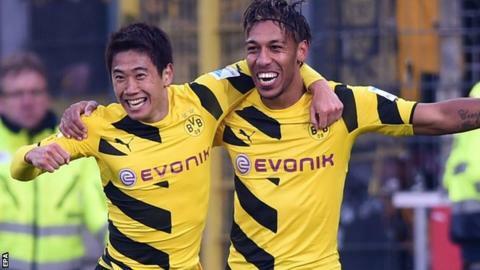 Borussia Dortmund eased the pressure on coach Jurgen Klopp with an impressive away victory against fellow Bundesliga strugglers Freiburg. Goals from Marco Reus and a Pierre-Emerick Aubameyang brace ensured a first league win since early December. Dortmund took an early lead through Reus's left-foot strike inside the box. Gabon striker Aubameyang capped a fine run for his opener before adding his second by finishing off a neat passing move on the edge of the area. The win moves Dortmund off the bottom of the table and into 16th, above Stuttgart who lost 2-0 at home to Bayern Munich. "We saw what happens if you have self-confidence," said Klopp, whose side had failed to win in five league games. "Today things were a lot better. I am not surprised. I know what this team is capable of." Dortmund - runners-up last season and champions of Germany in 2011 and 2012 - suffered an 11th defeat of the season in their previous game at home against Augsburg. Players had to calm down vocal supporters at the final whistle after the match at the Westfalenstadion. Match ends, Sport-Club Freiburg 0, Borussia Dortmund 3. Second Half ends, Sport-Club Freiburg 0, Borussia Dortmund 3. Jakub Blaszczykowski (Borussia Dortmund) wins a free kick in the defensive half. Foul by Dani Schahin (Sport-Club Freiburg). Attempt saved. Henrikh Mkhitaryan (Borussia Dortmund) right footed shot from outside the box is saved in the centre of the goal. Assisted by Matthias Ginter. Attempt blocked. Nuri Sahin (Borussia Dortmund) left footed shot from outside the box is blocked. Assisted by Neven Subotic with a headed pass. Substitution, Sport-Club Freiburg. Nicolas Höfler replaces Pavel Krmas. Offside, Borussia Dortmund. Henrikh Mkhitaryan tries a through ball, but Lukasz Piszczek is caught offside. Attempt missed. Henrikh Mkhitaryan (Borussia Dortmund) left footed shot from outside the box misses to the right. Corner, Borussia Dortmund. Conceded by Oliver Sorg. Corner, Borussia Dortmund. Conceded by Roman Bürki. Attempt saved. Pierre-Emerick Aubameyang (Borussia Dortmund) right footed shot from outside the box is saved in the top centre of the goal. Assisted by Lukasz Piszczek. Attempt missed. Matthias Ginter (Borussia Dortmund) header from the centre of the box is close, but misses the top left corner. Assisted by Shinji Kagawa with a cross following a corner. Substitution, Borussia Dortmund. Henrikh Mkhitaryan replaces Marco Reus. Corner, Borussia Dortmund. Conceded by Christian Günter. Attempt saved. Pierre-Emerick Aubameyang (Borussia Dortmund) right footed shot from outside the box is saved in the centre of the goal. Assisted by Jakub Blaszczykowski. Felix Klaus (Sport-Club Freiburg) wins a free kick in the defensive half. Offside, Borussia Dortmund. Jakub Blaszczykowski tries a through ball, but Marco Reus is caught offside. Goal! Sport-Club Freiburg 0, Borussia Dortmund 3. Pierre-Emerick Aubameyang (Borussia Dortmund) right footed shot from the centre of the box to the bottom right corner. Assisted by Shinji Kagawa. Corner, Sport-Club Freiburg. Conceded by Jakub Blaszczykowski. Attempt blocked. Maximilian Philipp (Sport-Club Freiburg) right footed shot from outside the box is blocked. Substitution, Borussia Dortmund. Jakub Blaszczykowski replaces Kevin Kampl. Offside, Borussia Dortmund. Mats Hummels tries a through ball, but Kevin Kampl is caught offside. Attempt saved. Marco Reus (Borussia Dortmund) right footed shot from the right side of the box is saved in the top right corner. Assisted by Lukasz Piszczek. Maximilian Philipp (Sport-Club Freiburg) wins a free kick on the left wing. Foul by Kevin Kampl (Borussia Dortmund). Attempt blocked. Dani Schahin (Sport-Club Freiburg) right footed shot from outside the box is blocked. Assisted by Maximilian Philipp. Attempt missed. Oliver Sorg (Sport-Club Freiburg) right footed shot from outside the box is close, but misses to the left following a corner. Hand ball by Kevin Kampl (Borussia Dortmund).